One of the things I want to add to the blog this year is reviews – whether it be books, yarns, or tools we’re all using new products all the time and it’s nice to read reviews to help us decide what is worth our precious dollars. I’m going to start this month with Susan B. Anderson’s new book – Kids Knitting Workshop. I ordered this book for two reasons. First, I love everything Susan and readily admit to having a total knitting crush on her. I was lucky enough to meet her a couple of years ago at a book signing/knitting afternoon. She was just as delightful as you might imagine. It was her Itty Bitty Hats book that really inspired me to start knitting and selling hats for babies and kids. I’ll stop gushing now lest I cross the creepy stalker line! Second, was for a more practical reason. One of the things I would like to develop and put into motion this year is a knitting class for kids. When I saw Susan was publishing a book on the subject I knew it would be the best way to figure out how to teach kids to knit. I’ve done a lot of crafts with a lot of kids but have always shied away from teaching them to knit. This is mostly because I wasn’t even sure where to begin and this book provides a blueprint. As with all her books, the photography is outstanding! There are a number of really interesting projects and you can check them out on Ravelry (which by the way is a great feature on Ravelry – if you are thinking about buying a book but have not been able to flip through it you can almost always find all the patterns in the book by looking it up on Ravelry and that can help with the buying decision!). My favorites are the Snowman and the Stripy Tube Scarf. But all are fun and would make for interesting first projects. I started reading at the beginning and found it most interesting that she recommends teaching kids the continental method to knit. I can’t even figure that out so I was surprised to see this is how she teaches kids. I learned to throw and have never figured out continental. Over the years I’ve made some half-hearted attempts to learn continental but have always given up in frustration. I know it’s faster and also seems to be easier on the arm and shoulder without all that throwing so it has remained on my list of things to learn. I was talking about this two weeks ago at knit night. L., who works at the store, told me that if I just did it for a month I would get the hang of it. I’m working on the Derecho by Laura Aylor at knit night right now. I’m determined to finish it whether or not it kills me. I’ve also banned myself from taking anything else with me until this is done! It’s another Kauni yarn project I started and always end up regretting halfway through the balls of Kauni. 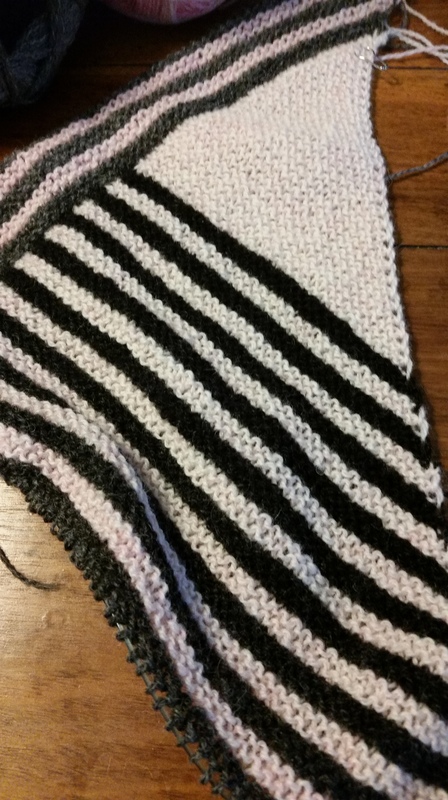 The Derecho is all garter stitch and will never, ever end! (I realize it’s not the pattern’s fault or the yarn’s fault they’re both lovely but it’s time for it to be over!) But, all that garter stitch also makes it the perfect project to learn continental. On Thursday I brought my book and my Derecho and went to it. Sadly, no one took pictures of the faces I made in the early rows, it was not pretty. Now, I can hear some of you saying “Wait!!! You can’t change knitting styles halfway through a project!!!! !” I know, I know, this may throw off my gauge but this is a garter stitch shawl so a few tighter or looser rows is not really going to make that much of a difference in the long run and to be quite honest I don’t think you can tell where I started the continental technique. By the end of the night I was kind of getting the hang of it and I think L. is right, give it a month and then figure out how to purl! I’ve not yet taught a child to knit but I did teach myself to knit continental which is something every other tutorial I’ve seen/watched has failed to do so I’m going to give this book five knitting needles*! *The scale is, of course, 1-5 knitting needles with 5 needles being the highest! What’s on My Needles this Weekend? There are so many projects (an excessive number even for me, a very committed polygamous knitter…) currently on needles that I am really going to have to focus. 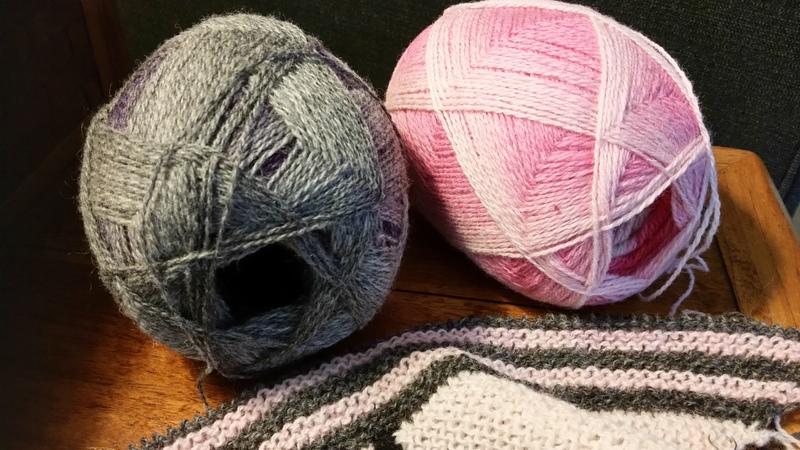 It’s one of those periods for me – I can’t knit fast enough and I can’t start enough projects. Talk to me in six months and there will be nothing to knit. The WIPs that I remember include: a pair of socks (sock #2 is almost done); a cowl; a wrap; another wrap and the project that I am currently obsessed with and have tossed all other aside for – the Derecho. I started the Derecho which can be found here on Ravelry a couple of weeks ago when I was finally in town to meet up with my Thursday night knitting group. Most yarn stores that hold knit nights have an unwritten (and maybe written in some cases) rule that while you are sitting and knitting in the shop you use yarn that was purchased at the shop. My LYS does not really enforce this rule but I usually try to follow it. I think it’s the proper thing to do, not that I have not brought in other yarn in a pinch (the week before Christmas or other looming knitting deadline) but I try to do it as often as I can. Besides, it’s not like I don’t have a ton of yarn and projects that I can work on. I keep my indie dyes at home and it provides me the variety I seek. Anyway, I’m working on a Wiggle Wrap using Kauni wool which only has one pattern row but even that was too much for me at knit night so it got crossed off the approved knit night list. My Whisper Wrap is on another set of needles and I’m using some sale yarn from the store but every row is a pattern row so no go, plus the lace weight yarn is a bit much to deal with while gabbing. The cowl is some cool indie yarn – see my last What’s on my Needles this Weekend post for more info. The socks, likewise, are more indie yarn. This left me with nothing to work on at knit night. I did a quick inventory of my yarn room and found the next set of Kauni wool I had not been able to refuse. A couple of ladies from our group had used two balls of Kauni to make the Derecho and I thought they looked great and was yet another great pattern for the beautiful color changes of the Kauni. It’s also all knit – no pattern rows, nothing. Just increases in the same place every row. It’s the perfect pattern for knit night!! It doesn’t even require any other tools – no measuring tape, no stitch markers. I love it! Between the fun construction and the fascinating color changes of the Kauni I can’t put this project down!! I love the way the shawl is constructed on an angle with two sets of live stitches. I was also surprised to find some purple in my ball of Kauni which I had thought was the black/grey colorway. The purple will look great in it! Now, I will get back to it and take advantage of this long holiday weekend to see how far I can get!